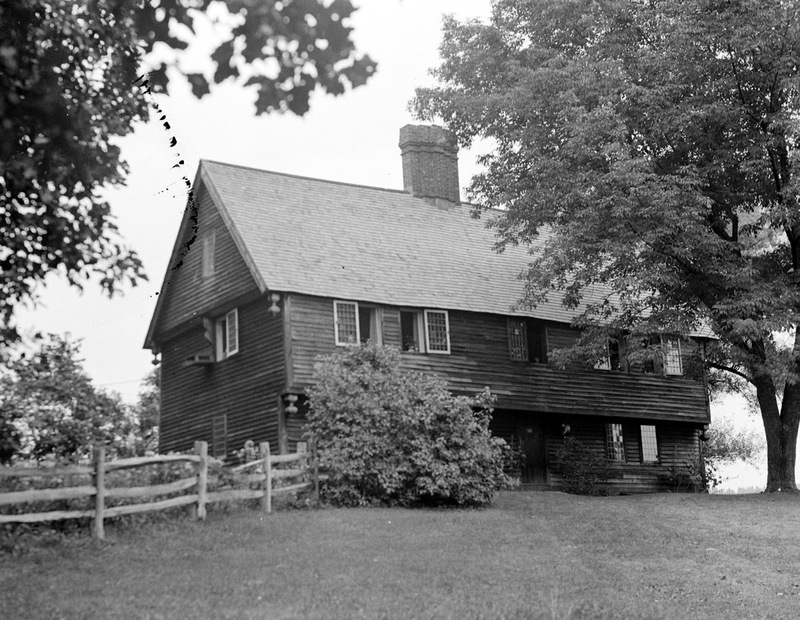 Parson Joseph Capen built this house in 1683 in Topsfield, Massachusetts. He ministered to the town from 1682 until his death in 1726. The house open for visitors in the summer. There is a story about this house - that it is still here because it was owned by an old Boston family with extensive land holdings.Their herdsmen drove cattle to market in Boston along Rte 1 (which is practically next door to this house) and used the house as a way station on their trip into the city. So it wasn't torn down, updated, or abandoned. We are lucky. This picture is from the HABS archive. The site above has photographs in color! I was especially interested in the geometry of this house because I wanted to compare it with the Andrews French House which is less than a mile away. For that geometry see my post: http://www.jgrarchitect.com/2014/01/the-french-andrews-house-geometry.html. The geometry here is based on the square. The arc of the circle which surrounds the square is used sparingly. See #1: 'a'' is the radius of the circle and half the diagonal of the square. The square and its arc used for the Parson Capen House have dark lines. The square divided in half and its diagonals are often employed. 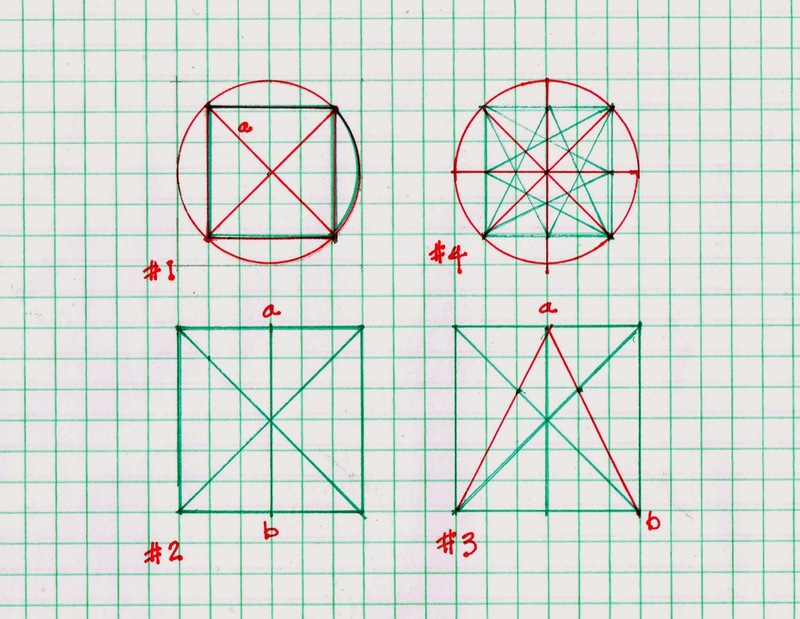 See #2: the square divided in half at 'a-b', and #3: the diagonals in red, also 'a-b'. The intersections of the two diagonals I have emphasized with a spot. For fun, and to emphasize how simple this design is, how complex it could have been, I have drawn #4: some of the possible diagonals that could be drawn inside a green square placed in a red circle divided into 8 equal segments! There could be more..... for example, I could rotate the square 45*. The geometry was used for framing. The design, the visual impact and what we refer to as 'First Period' New England architecture, comes from the framing. Remember that you can click a drawing to enlarge it. The builder laid out the house from the chimney block. The diagram shows the brick wall in the center with 2 square spaces on either side, the parlor and the hall. Next comes the size of the fireplaces themselves. They extend off the central brick fire wall. Their depth is determined by the arc of the circle which circumscribes the square. I have shown the arcs and added dotted lines and arrows to show you where to look. The second floor overhangs the first by just over a foot on the south/front side. This was popular in England as a way to protect the daub and wattle walls from rain and wind. Here weather boards - known today as clapboards - covered the frame, but the tradition continued. The attic extends out over the second floor on the sides of the house for the same reason. The squares simply crossed, beginning on the opposite side of the common chimney wall. And the fireplace, set into the room to allow space for the first floor flues, is again determined by the arc of the circle circumscribing the square. Again, see the dotted line and arrow. In the hall the beam needed to be beyond the 2nd floor fireplace. 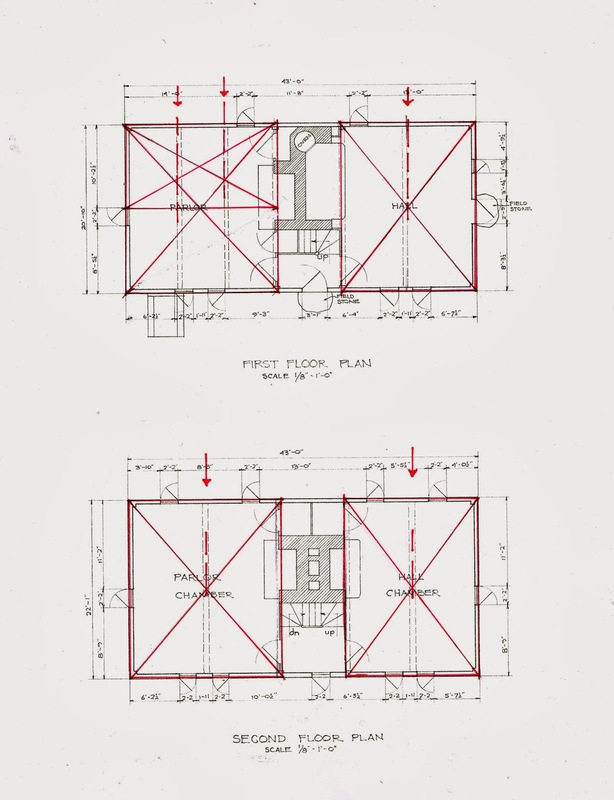 The remaining floor space was divided in half - 2 diagonals. Where they cross in the center is the location of the ceiling beam. The parlor, the room to the left, is larger. It needed 2 beams. So the space is divided into thirds. My diagram #3 shows how this was done. See the 'star' pattern and the 2 arrows left. The intersections divide the room into thirds. On the second floor the rooms are again divided in half to find the location of the ceiling beam. 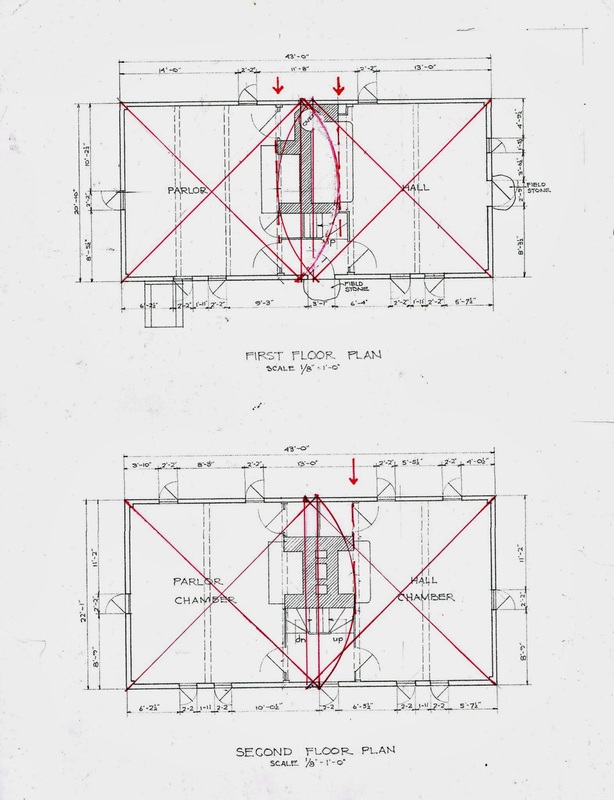 I find it interesting that the beam in the right-hand room on both floors is not quite centered. Did someone with less experience set this part of the frame? 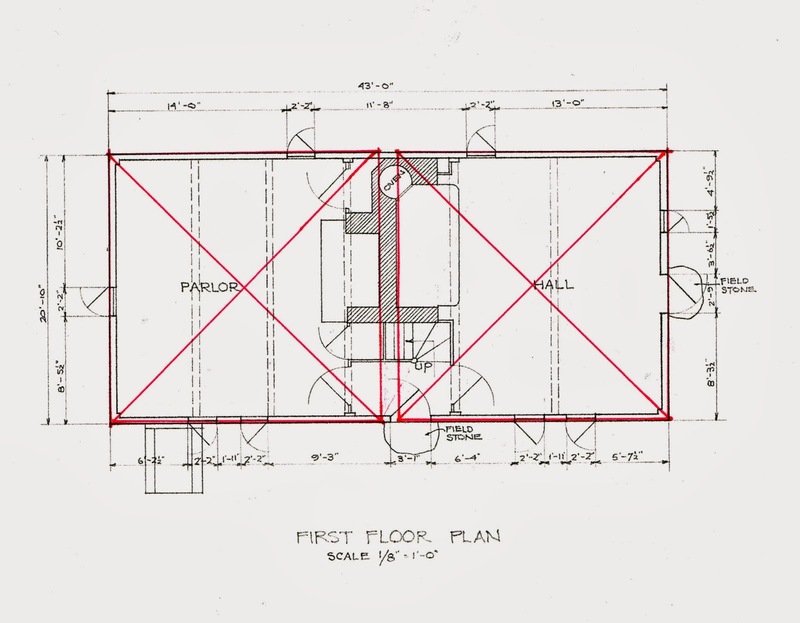 Because the floor plans were determined by squares I tried the same geometry on the end elevation - how had they determined where to put the beams for the second floor and attic? Start on the right with the end elevation. The shape is a square with its arc determining the peak of the roof. Red square, arc, arrow and dotted line. The half-squares and their diagonals intersecting with the square's diagonals locate the beams. Green lines and arrows. I have left the other end elevation unmarked for an easy comparison. The front and rear elevations are 3 squares long. The center lines of the squares, the half-squares and their diagonals may have been used to locate the windows. 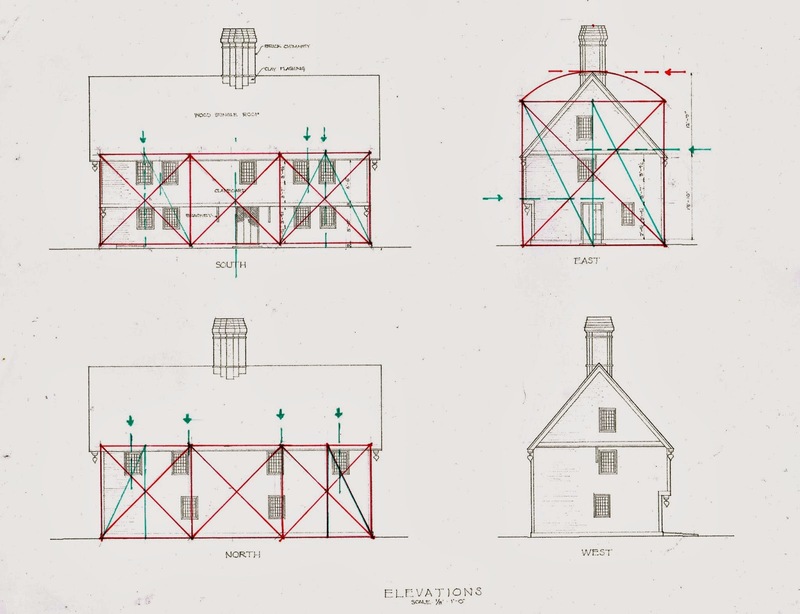 It is hard to tell partly because the measured drawings for the Historic American Building Survey, HABS, were done at 1/8"= 1'-0", a scale which is fine for concept, but not accurate enough for construction. See the green lines and arrows. * The Golden Section is not used here. * The front door is not centered on the facade nor between the brackets - those sit under the 2nd floor beams. * However a bit of the coming Georgian, Palladian inspired, rhythm and balance is evident; on the front the windows are matching pairs, and equidistant from the corners. The rear elevation is also symmetrical.